I have heard many couples say things like “We just grew apart”. Especially when marriages of many years break. They then announce “We are splitting due to irreconcilable differences”. I have given this a lot of thought and I have come to realize that isolation is a gradual process. I believe it’s because pending issues are not dealt with on time. The couple lives under the same roof for years. They even wear uniform clothes to occasions but still they are miles apart. Their hearts are nowhere from being one. Sadly, young couples too can have this problem called isolation. -Unforgiveness. Conflicts are normal. Resolving them though require maturity. If there has been build up of unattended hurts, unresolved issues, the couple is gradually being drawn apart from each other. Unforgiveness deposits layers of scales in the pipe your love and of course, the longer this continues, the thicker the scales. It clogs the pipe of love. -Insincerity. By that I mean one or both parties live with their partner to make a show or just to keep the peace. They don’t say things as they are. Such a relationship looks perfect on the surface but has no roots in love. They do what they do because they don’t want a scandal not because they want a working relationship. – Competition. One party wants to look better than the other. Team spirit is not at work in such a marriage. Everyone is fighting for himself/herself. The “We” idea is lost. The “Me” syndrome has eaten deep into such a home One person wants to take all the credit for any good that happens. Isolation from one another is the result of this attitude. Have you grown apart? 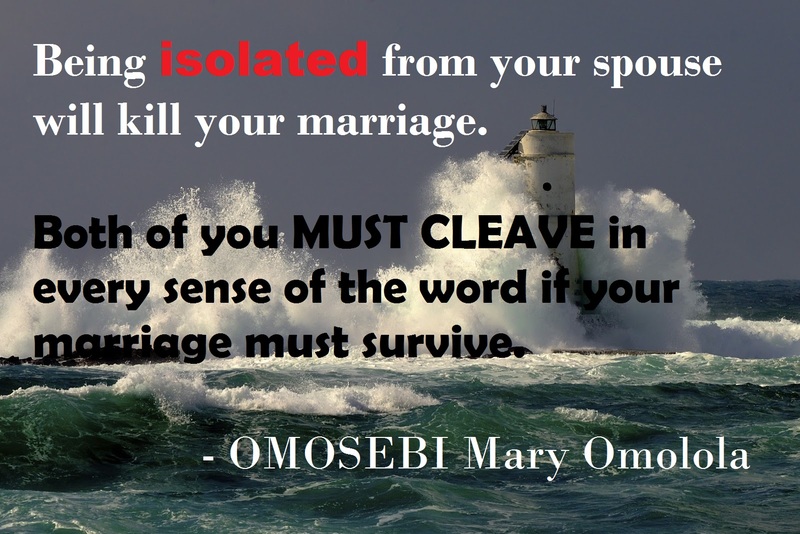 Do you feel isolated from your spouse? The choice is yours to mend the broken bridge between you or not. Our choices as married people either draw us closer to our spouses or away from them. You must decide what you want. Once you decide that you want unity restored to your marriage, go to God in prayers. Ask Him to bring you and your partner close together. Next is to have a talk with your spouse. Then you must take practical steps to cease from shutting your partner out of your life. Share information. Share details. Be naked and not ashamed. Communicate without fear of being condemned and be ready to listen too, without condemning your spouse. Decide not to go to bed with unresolved conflicts. Let the change begin with you. These are things you need to make up your mind to do. I pray this day for marriages dealing with isolation, Lord bring them back together. Everything that is trying to (or has) put them assunder be removed in Jesus’ name. I ask that the Blood of Jesus will seal every crack in the walls of these marriages. Father, help them walk in unity. Help them touch each other deeply. May these marriages experience divine restoration in Jesus’ name. I would still counsel that she keeps doing what she is doing. The fact that the husband is acting badly does not mean the wife should join him. Like I said earlier, "let the change begin with you." She should simply continue to pray for him. The admonition in 1Peter 3:1 (Wives, in the same way submit yourselves to your own husbands so that, if any of them do not believe the word, they may be won over without words by the behavior of their wives, when they see the purity and reverence of your lives) should help. She should continually place his heart in God's hands. He will direct it the way He wills. In short, I'll say that the sister should not give up. She must always remember that whatever she does must be "as unto the Lord". She seeks to honour God by working towards fulfilling God's purpose for marriage- a united force. Someone asked: What If a sister is doing what is recommended in the post and her husband is the one holding on to past hurts (unforgiveness), being insincere or competing? What can such a sister do?